Whether you are looking for a large space to hold a private or business event, you need to be careful in choosing your venue. Having a room that is not only properly sized, but meets a host of other key factors is a must if you’re going to have any hope of hosting a successful function. To help you make the right choices, when planning your next affair, we offer you these few suggestions of the things you should consider before picking a function room. Everyone wants the best of everything, when they are planning an event and of course you want your guest, whether you are planning a wedding or a business conference, to leave talking about how well everything went and all the little extras that you arranged to help make it perfect. The problem is that all those little things can, very quickly, add up to big expenses. So, first and foremost set your budget and then use it as a guide for finding your event space at the Greek Club, we offer multiple venues to cater to all budgets. Once you have your budget set, you need to make a checklist of “must haves” for your function. Your chosen room should be large enough to accommodate the expected guest, but not so large that people feel lost. Too much space can kill an event as easily as too little. If you are hosting a business event, find out if Wi-Fi, projectors, tables and comfortable chairs and any other equipment or services you may need are available. If your event involves making a presentation or you are having a band play you will need to find out if a stage and podium are available. Nothing sets the mood of an event like lighting; make sure that your chosen venue has appropriate or adjustable lighting. Is the room’s décor suitable to your function and do you have options as to how and who will handle decorations? And a host of other possible functions are all very different and have their own individual needs, when it comes to a function room. What is appropriate for a business presentation would make for a very boring wedding party and what would be suitable for a Quinceanera would be more than a little distracting for a board meeting. The first step to hosting a successful event is choosing the proper setting to hold it in. 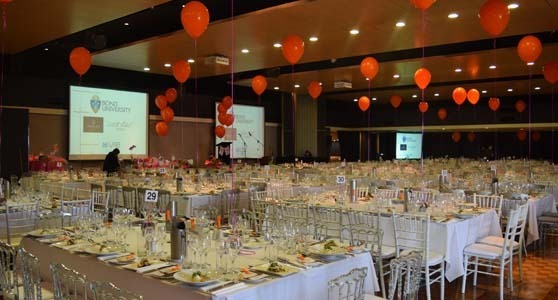 Hopefully, these few pointers will help you in your search for a large function room.